Company Overview - Chengdu King-Tiger Pharm-Chem Tech. 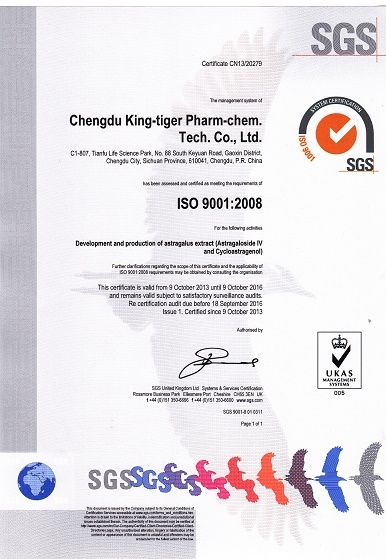 Co., Ltd.
Chengdu King-Tiger Pharm-Chem Tech. Co., Ltd.
Chengdu King-tiger Pharm-chem. Tech. Co., Ltd., founded in the year of 2007, is the few professional manufacturers for the series of natural high purity product. Its core business is researching and developing, separating and purifying from the traditional Chinese medicine and natural plant herb to find compounds which have significant biological activity. Its representative products were Astragalus Extract such as Astragaloside IV, Cycloastragenol, Astragalus P.E., Astragalus polysaccharides,Calycosin-7-O-beta-D-glucoside,etc.Chengdu King-tiger Pharm-chem. Tech. Co., Ltd. R&D and sales department located in Tianfu Life Science Park,Gaoxin District, Chengdu City. The R&D center with highly qualified R&D team, equipped with HPLC, UV and other advanced equipment and testing instruments, focused on researching new products and new technology etc.Chengdu King-tiger Pharm-chem. Tech. Co., Ltd. factory located in Dayi County, Chengdu City.The extraction and refined production workshop which were designed in accordance with GMP requirement,is mainly used to produce high purity natural plant extract to meet the domestic and international markets. Its processing capacity is up to 1,000 tons per year. This workshop has complete sets of equipment, such as pre-processing, concentration, extraction, column chromatography separation, refrigeration, spray drying and vacuum drying etc.It is ISO9001:2008 certified.All products are produced under GMP condition and strictly tested by MS, NMR, and HPLC.Now we regularly produced astragalsoide IV 0.3% to 98%, Cycloastragenol 5% to 98%,Astragalus P.E. at different ratio eg.5:1, 10:1, 20:1 etc.,Astragalus polysaccharides 50%,Calycosin-7-O-beta-D-glucoside 0.5%-5% etc.